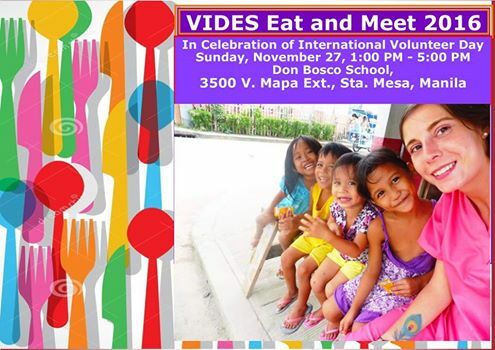 VIDES Philippines Volunteers Foundation, Inc. invites you to an afternoon of fun gathering, sharing, and giving back to the community. Meet our local volunteers & our friends from Germany, France, & Italy! Learn about volunteering opportunities here & abroad, learn basic greetings in French & Italian, learn arts & crafts, and design handmade gifts for aeta kids in Pampanga. Tickets for the event are prized at only P100.00 each! For this minimal amount, you get to help us buy baking equipment for the VIDES Livelihood and Development Center. Your ticket already includes a food stub. Attendees to the event will get a chance to win Starbucks gift certificates and merchandise! This event is open to the public. Bring your family and friends! No need for reservations. You may buy tickets at the venue. Join our VIDES Eat and Meet 2016: Volunteers’ Fair on Sunday, 27 November 2016, 1:00 to 5:00 pm at Don Bosco School Sta. Mesa, 3500 V. Mapa Extension, Sta. Mesa, Manila. For more information, please contact us at 0915-2978956 or (02)715-6740. Learn. Share. Make Friends. Make a Difference.